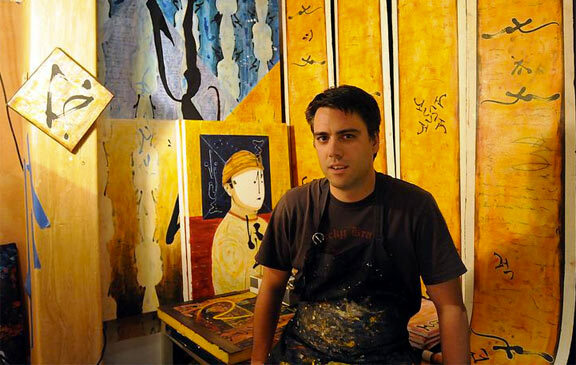 We discovered Will Kerr through an article in Framingham’s Metro West Daily News titled Framingham man lands job as artist in residence at China’s Sichuan University – Never heard of Framingham? Neither had we. But we followed the story up and met with Will Kerr and talked to him about his residency at Sichuan University, the Chinese art scene, how this experience is influencing his own art and what he has planned for the future. CL: Could you give us a quick introduction? My name is Will Kerr, I’m a painter from Boston. I’m painting every day in Chengdu right now, and I’ve been here for a year. CL: What brought you to Chengdu? W: I wanted to interact with a culture that was different from what I had experienced. I had an appreciation for the history of Chinese art and philosophy and I just wanted to open myself and interact with that, have it come in to me. Like the way you eat a hot Sichuan peppercorn (laughs). CL: What organization brought you to Chengdu? W: A great Chinese artist and professor at Sichuan University named He Gong invited me here. I came to paint alongside a group of artists that he’s a part of. It’s been great. For the first time, I was allowed to focus on painting every day. My responsibility was to maintain my own studio and interact with the other artists, and learn from them and teach them. After 6 months in this environment I felt that it was maturing and I felt passionate about sticking around. To continue living in Chengdu and continue producing art. CL: How do you feel about Chinese art? W: There’s a wonderful dichotomy. On one side, there’s so much tradition, technique, pedagogy – so much of a self awareness that’s a part of it. It’s rooted in history. But at the same time, it’s very experimental. Chinese artists, whether they’re painting or making music, they’re trying to find the pulse of the moment and create from there. It’s a dynamic arena for art. 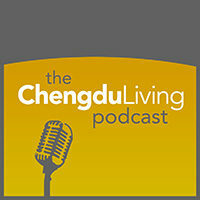 CL: Has your time in Chengdu had an impact on your painting style, or the way you approach art? W: Yeah, for sure. I started just living with farmers, and the whole way they live and work had an impact on how I approach my work from a cultural level. But then seeing how artists are trying to process western modern art and trying to find their own voice after having such a strong foundation – it’s that dialogue, that competitive arena for Chinese artists – it’s pretty major league. People are really good and it’s inspiring to be part of that, where there are so many good artists. W: My background is in philosophy, that’s what my formal training is in. Then I found art, 11 years ago, and decided to commit to that. I’ve been a curator, painter, producer for years. I’m a lot of things – sometimes people ask me what I do for a living and I say I’m a candle stick maker. Then they ask me: “Really?” and I say yeah, I’ve made candle sticks. Sometimes that was just easier (laughs). But I’m a painter. CL: You have a gallery in Boston, is that right? Tell me about that. W: I’ve opened a few galleries but I still run Gallery XIV. I’m the creative director. It’s really a gallery about pure aesthetic: whether it’s a piece of antique furniture made in France in 1750 or a painting made in 2005, the two can go together because they’re both authentic. So Gallery XIV is a fusion, mostly of antique furniture and contemporary paintings. We’ve host a lot of cultural events there, music and art, culinary events, and so on. It’s a fusion of elements. CL: What do you think is the impression of Chinese art outside of China? W: I think it’s exotic but that most people have a hard time wrapping there mind about it. People know it’s big and that something is happening but I don’t think people really have an idea for how dynamic it is. 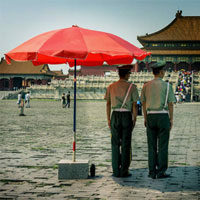 CL: What are some of the biggest themes in Chinese art? History or politics, something else? W: I would say individuality. A quest to be individual, or a quest to have a voice. CL: What would you say to artists who might have interest in coming to China to pursue art or paint? W: My sense of it is that it’s really a culture of craft. There’s a real respect and honor for craft. Putting yourself in a different environment will have an impact on what you make, and China has an art history that’s thousands of years old. It’s epic, and in a lot of ways this is China’s moment. CL: Where can people check out your stuff? W: They can check me out at Gallery XIV. CL: Any other message you’d like to communicate? W: I love Chengdu Living, it’s great for Chengdu and people who want to see what’s happening. I’m glad to be able to share what my experience has been like through the website. I appreciate it. Collaboration is so important and it’s great to be able to do that in Chengdu. This apron is nice, where can I buy it? Hahaha – pretty sure it’s just a plain black apron with paint on it. I have been spending some time with WIll recently and he is really doing some amazing things. 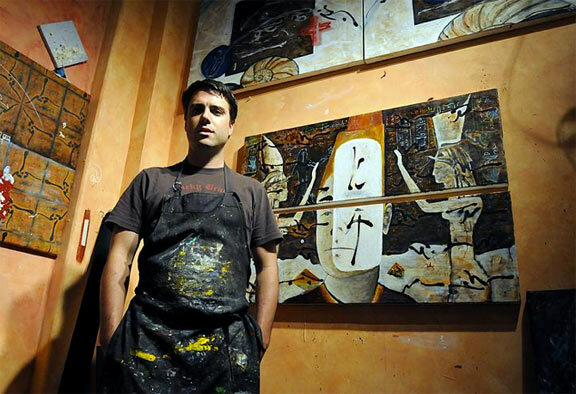 He helped me with a major breakthrough … the man is not only an artist, but a friend of artists. Anyone out there need creative consulting? It is great to see this art (western+eastern culture combination puls individuality) it is very different. I’ve never seen any art like this. I love it. Thanks I appreciate your quick reponse. I will keep in touch.